I just read a great piece in today's Toronto Star about the modern library in Seattle. I'm certainly more of a traditionalist when it comes to architecture, but recognize the place that modern buildings can serve in a 21st Century city. Unfortunately, most modern buildings are crap at the street level or don't serve their purpose properly. Sometimes it seems that architects just try to come up with things that are ridiculous...the more ridiculous, the more modern. See Toronto's AGO expansion, for example. I love the colours, steel, glass and comfortable public places in the Seattle library. Hamilton is moving ahead with plans to renovate the main entrances and exteriors of both our Central Library and Farmer's Market this year. York Blvd will also be redeveloped, hopefully into a two-way street with all through trucks banned from the downtown core to make this into a pedestrian friendly street with patios, market stalls and great public places. 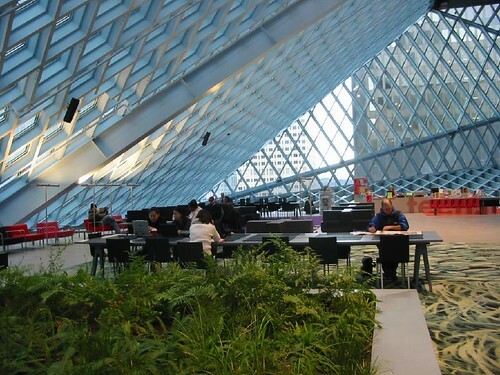 The interior of our library could certainly take some cue's from the Seattle library and hopefully will.